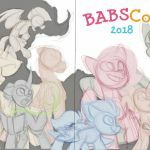 Over the next few weeks I'll be posting some of the other things I've drawn for BABScon, specifically stuff like badge art! Finished February 2nd 2018 and made digitally in Sketchbook Pro with a Wacom Intuos tablet. Please don't repost without credit. The characters are the mascots of BABSCon. Comments and sharing are very much appreciated! Wow, this was probably a fuckload of work! It really was! It was worth it though, and I'm super happy with how it came out! And it reposted my comment for some reason. I just love the look of this. The texture, the bright colors. It all looks like a fun cartoon, or even a fun video game!